On July 4, 1863, John C. Pemberton formally surrendered his Confederate forces to General Ulysses S. Grant. Unlike his unconditional surrender policy at Fort Donelson, Grant offered parole to Confederate POWs. Grant made the decision not to attempt to feed or transport thirty thousand Confederate soldiers. Among those taken prisoner that day was one of my Confederate ancestors, Westley Avans. On July 9, Westley Avans of the 43rd Tennessee Infantry was formally paroled. According to records, Westley was thirty-five years old when he volunteered for service.In May 1862, the Confederate Army was re-organized under the Conscription Act passed in April 1862, which required military service from men ages eighteen to thirty-five. In the re-organization, Westley “retired” from service. He was thirty-six to thirty-seven years old after all. Later that Summer, the Confederate Congress passed another conscription act which extended the age of service to forty-five. Westley found himself back in the 43rd. By December of that year, Westley and the rest of the 43rd moved by rail to Vicksburg. 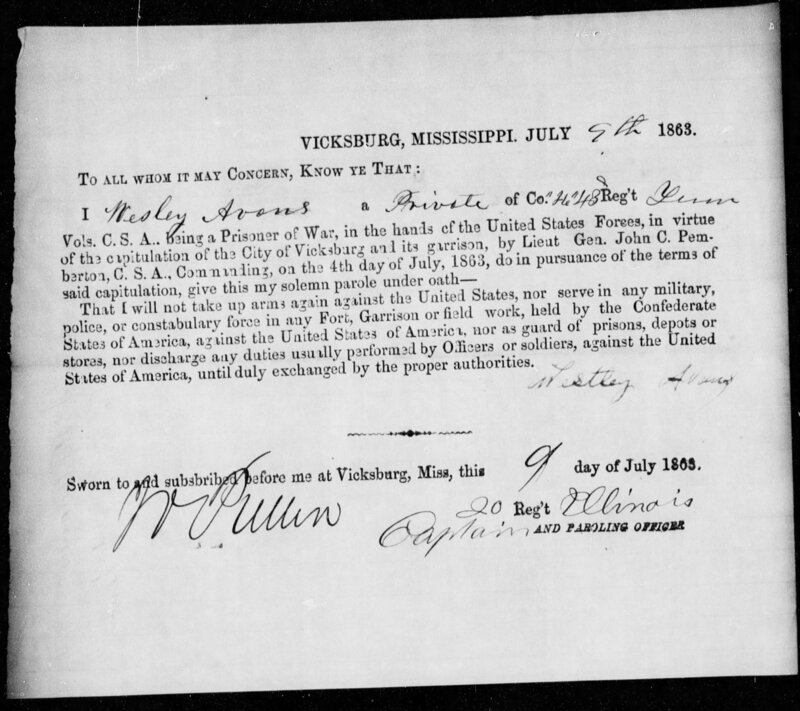 I have yet to find any information regarding Westley’s wartime service after his parole on July 9, 1863. It is possible that since McMinn County was under Union occupation by late 1863, that Westley simply returned home. Of course, if anyone finds anything otherwise, I’m all ears.